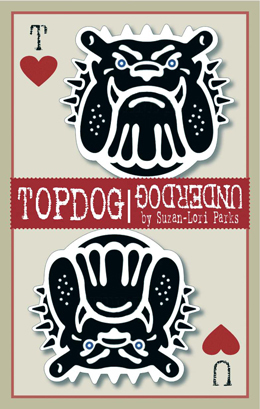 "Topdog/Underdog" centers on two African-American brothers named Lincoln and Booth (their dad's idea of a joke). Abandoned by their parents to fend for themselves while still juveniles at the respective ages of 16 and 11, the brothers are now in their thirties. They live marginal lives sharing a rented room in a low-rent district. Their relationships with women have been spotty at best. Booth, the younger, wants to be a master at the con game of three card monte, which dupes the mark, or sucker, through misdirection. Lincoln has been a past master at three card monte, but has set the game aside to pursue a legitimate employment: portraying the 16th President in whiteface in an especially tasteless amusement arcade attraction, in which Abraham Lincoln is repeatedly assassinated over the course of a day. One day, the circumstances of Lincoln's employment change, drawing Lincoln back into the underworld of three card monte, where he is still a master and ready to make more big scores. The festering sibling rivalry between the two men now threatens to develop into a dangerous, explosive boil. "Topdog/Underdog" mixes humor, anger, suspense and drama in a play which comments on human relationships, the dynamics of family, race relations and American history. The play won its playwright, Suzan-Lori Parks the Pulitzer Prize in 2002. Her other works include "The Death of the Last Black Man in the Whole Entire World," "The America Play," "Venus," "In The Blood," "365 Days/365 Plays," and more. James Reynolds directs this new production of "Topdog/Underdog." He is known and loved by millions of fans for his role as Abe Carver through 28 seasons of the daytime TV drama "Days of Our Lives." His previous directing credits at Fremont Centre Theatre include "National Pastime," "Ravensridge," "Murder Me Once," and "The Tangled Snarl." Also at the Fremont, he appeared in a solo show about Black history, "I, Too, Am America." "Topdog/Underdog" stars Jed Reynolds as Lincoln and Stephen Rider as Booth. Jed Reynolds appeared previously at Fremont Centre Theatre as Jackie Robinson in "National Pastime" and as the young romantic lead in "Ravensridge. He has also toured with the Native Voices theater company and appeared locally with the Parson's Nose company, and appeared often on "Days Of Our Lives."